I don’t have much to say about this recipe, other than it was adapted from Bon Appetite Magazine, and that it was down-right delicious! As with most soups and stews, this one tastes great the longer it’s had a chance to sit. If you have the time, make it a day, or even two in advance. 1/4 to 1/2 Cup Red Hot – depending on your tolerance for heat! Let simmer, stirring occasionally, until thickened, about an hour and 15 minutes. 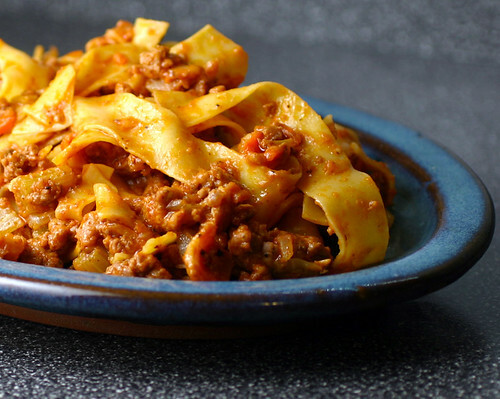 While sauce is simmering, boil water and cook the pappardelle pasta, about a pound. Cook until al-dente, drain, then toss with sauce just before serving. I keep looking at this picture and then wondering why I don’t have any on a plate in front of me. Looks so good! Can I assume Red Hot is Frank’s hot sauce??!! I’d leave out the onions though! Hope you had a great weekend Mary – when is our weather going to get better?? Indeed! Frank’s Red Hot ROCKS! You can’t leave out the onions though! They are necessary in the mirepoix, otherwise it’ll make the whole thing taste of carrots. I’d recommend using 1 cup of onions instead of 2, if you are not a lover of onions. Made this for the family on Sunday. I’m not Italian, nor have I made Bolognese before. It turned out so well. Thank you so much for the inspiration. Glad you liked it! Thanks for coming back and letting me know!